Located just outside the main conference, visitors interested in exploring the latest fintech innovation should head to this dedicated showcase. Designed specifically for you to help meet your technology, customer service and marketing needs, it is a must-see on the exhibition floor. Plus, it is the most effective way to stay ahead of fintech innovation in the Middle East. "FSS is a Payments and Fintech leader that offers a diversified portfolio of software products, hosted payment services and software services built over 26 years of comprehensive experience across payments spectrum. Its end-to-end payments suite powers retail delivery channels such as ATM, PoS, Internet, Mobile and Financial Inclusion as well as critical back-end functions such as cards management, reconciliation, settlement, merchant management and device monitoring. FSS caters to the wholesale and retail payments initiatives of 100+ clients, which includes leading Banks, FIs, Processors, Merchants, Governments and Regulatory Bodies spread across India, America, UK/Europe, ME/Africa and APAC regions"
Geidea is a private company and the exclusive partner of VeriFone headquartered in Riyadh, Kingdom of Saudi Arabia. The company was established in 2008 with branches in Jeddah, Dammam, Abha, Tabuk and an international Research and Development center based in Bangalore, India. Our core business includes e-banking Point of Sales (POS). Geidea has established its reputation in Saudi Arabia as a leader in e-banking solutions. Aramex is a provider of comprehensive logistics and transportation solutions. Established in 1982 as an express operator, the company rapidly transformed itself into a global brand recognized for its customized services and innovative multi-product offering. The range of services offered by the company includes international and domestic express delivery, freight forwarding, logistics solutions, consumer retail services and e-commerce solutions. areeba is a financial technology company with outstanding expertise in the following lines of business: Payment solutions: cards issuing and processing, contactless solutions, mobile payment technologies, governmental solutions, co-branded programs, cards marketing advisory. Merchant servicing: e-commerce, point-of-sale payments, tokenization, contactless payment, unattended kiosks. Loyalty solutions: reward points, mileage, airtime and cash back. "Bayan Payments (“BayanPay”), was established in Riyadh, in 2018, to build payment gateway (aggregation model), capable of meeting the rapidly growing e-Commerce needs and introduce Digital Wallet in Saudi Arabia.BayanPay aims to be the preferred digital payment services provider, providing seamless & frictionless experience to global businesses and individuals.BayanPay is currently transforming the digital payments in Saudi Arabia, by offering a new generation payment gateway and innovative e-wallet to perform all financial transactions, including receiving and making payments, International Remittances and Forex. We are working with industry leading experts to transform digital payments in KSA and beyond." "BPC - World experts on the future of paymentsAt BPC, we are bridging real life to digital by equipping our clients with the right technology to create payments services that fit right into the customers’ lives. Real life needs of people who make payments or do business transactions converge into digital services. Is it a traditional card payment, mobile wallet or an instant payment, is it initiated via a mobile, through an agent of embedded into an app via an API? It no longer matters; everyone wants it fast, easy and secure.Founded in 1995 and headquartered in Switzerland, with more than 200+ clients in over 73 countries, we are an independent company and a global leader in our field." Collinson is a global leader in loyalty and benefits. We use our expertise and products to craft customer experiences which enable some of the world’s best-known brands to acquire, engage and retain the most demanding and choice-rich customers. Our solutions drive more profitable customer relationships, enrich their travel experiences, protect what matters and assist in times of need. Gemalto, the undisputed world leader in digital security and providing trust in smart city projects, enables banks, mobile operators, enterprises and governments worldwide to offer enhanced secure digital services to billions and delivers on people’s expanding needs for digital banking, data encryption, identity protection, mobile payment security, authenticated online services, cloud computing access, modern transportation, M2M communication, eHealthcare and eGovernment services. Giesecke+Devrient is a global company that offers security technologies, both in the physical and digital spheres. Every day, billions of people benefit from G+D innovations in their personal, digital and business lives. With around 11,300 employees across 32 countries, G+D is a leader in currency technology and in developing products and solutions for the safeguarding of payment processes, identities, connectivity, and data.For more information, please visit: www.gi-de.com.Visit us at the event on our stand in D32 and book a meeting with one of our experts. GSS international, established in 1988, is a leading provider of e-payment, mobile banking, e-government software & hardware in Middle East and Africa. GSS offers the solutions for instant issuing of all requirements in bank branches such as printing and personalizing payment cards, cheque booklets. Also cash handling equipment is one of the other GSS solutions for the banking system. Mint Middle East LLC (MINT) pioneered the first vertically integrated prepaid card for payroll payment service with its program management platform, proprietary branded card product and client based ATM network. Mint further strengthens its industry position by partnering with S2M to offer electronic payment solutions to different niche market including public sector. OMA Emirates, a leading service provider in the Middle East caters to the payment industry with cutting edge technology solutions for card personalization, payment issuance and payment acquiring systems and loyalty programs through a global delivery platform. The services offered together with strategic partnerships with leading world class technology vendors have been designed to provide clients with a seamless customer experience. Visit our website www.omemirates.com or meet us at Stand E82 to know more. S2M supports the dynamics of digital transformation through its innovation policy. Through its 3 entities, S2M Secure Digital Solutions, S2M Payment As A Service and S2M Technologies, S2M ensures the development, integration, and maintenance of digital payment solutions within in-house & outsourcing mode as well as the personalization of means of payments. Its expertise has allowed it to conquer the most prestigious national and international markets (More than 150 clients around 4 continents). Headquartered in San Jose, California, Verifone is the leader in providing trusted, secure and innovative payment terminals, global payment as a service, and commerce enablement solutions that create more valuable experiences and rich interactions between consumers and merchants. The company's products and services include mobile, countertop and self-service payment devices, software, and web-based gateways. With 5,300 employees worldwide, and partnerships with local distributors, Verifone is able to deliver innovative payment solutions in 150 countries and across vertical markets. The Wirecard Group has been supporting companies in accepting electronic payments from all sales channels. A global multi-channel platform bundles international payment acceptances and methods, flanked by fraud prevention solutions. When it comes to issuing their own payment instruments in the form of cards or mobile payment solutions, Wirecard provides companies with an end-to-end infrastructure, including the requisite issuing licences for card and account products.As a software and IT specialist, Wirecard is also constantly expanding its portfolio with innovative payment technologies.Wirecard AG is listed on the Frankfurt Securities Exchange (TecDAX, ISIN DE0007472060, WDI). Entersekt is an innovator of mobile-first fintech solutions. Financial services providers and other enterprises rely on its patented mobile identity system to provide both security and the best in convenient new digital experiences to their customers, irrespective of the service channel. Whether pursuing compliance through strong authentication and state-of-the-art app security or looking to meet consumer demand for on-the-go information sharing and payment capabilities, Entersekt’s clients always enjoy a competitive advantage. "Epson is a global innovation leader dedicated to exceeding expectations with solutions for markets as diverse as the office, home, commerce and industry. Epson's line-up ranges from inkjet printers, printing systems and 3LCD projectors to industrial robots, smart glasses and sensing systems and is based on original compact, energy-saving, and high-precision technologies." "Infineon Technologies AG is a world leader in semiconductor solutions that make life easier, safer and greener. Microelectronics from Infineon is the key to a better future. In the 2018 fiscal year (ending September 30), the company reported sales of about Euro 7.5 billion with about 40,100 employees worldwide. Infineon is the leading provider of security solutions. For nearly 30 years, we have been offering the industry’s broadest portfolio addressing the increasing need for security in the connected world. Our tailored and ready-to-use security solutions serve a wide range of applications from smartcard and ID applications to emerging applications like embedded, mobile and Internet of Things use cases. " Posta Plus is a leading courier and logistics organization operating in the MENA region with presence in US, Europe, and China since 2005. We provide domestic and international express distribution services, freight forwarding, warehousing, clearance, and e-fulfillment solutions with a proven track record within the E-commerce ecosystem where we unlocked delivery, COD, and reselling solutions. Posta Plus strives to provide its clients with tailor made solutions that fit their unique business model; that is embossed in our slogan: Delivered, your way. "At the heart of technology and media evolution, fast pace change and innovation is the story of Shams.The wise leadership of Sharjah has recognized and is determined to see:• Changes in our world today as opportunities• New media and technological development be embracedand cultivated• Innovation as a currency of sustainabilityThe three pillars of media (present and the future) are: Talent, Content and Technology.Sharjah Media City (Shams) is embarking to develop a media platform for Sharjah, United Arab Emirates and the region. Our role will not stop at licensing and regulating but will also extend to nurturing talents, businesses and investors to succeed." admitad is a global company providing international promotion for e-commerce business ventures. Using a high-end platform and tools admitad brings together publishers and advertisers from different e-commerce verticals such as retail, travel, banking and entertainment to boost online sales on CPS (cost per sale basis). Backbase is a fast-growing fintech software provider that empowers financial institutions to accelerate their digital transformation and effectively compete in a digital-first world. Our software, the Backbase Omni-Channel Banking Platform, unifies data and functionality from traditional core systems and new fintech players into a seamless customer experience, across all digital touchpoints. Capillary’s technology solutions help businesses get ahead of the digital evolution and stay ‘Always Consumer Ready’. Over 300 marquee brands across 30+ countries, including Pizza Hut, Malabar Gold, REDTAG, Herfy, Walmart, Al-Futtaim, KFC, Starbucks, and Samsung, trust Capillary to enable easy and seamless consumer experiences. With over 300 million consumers and 25,000 stores on the platform, Capillary is Asia’s leading SaaS product company. Over 800 Capillary associates across 14 global offices are continually innovating to find new ways for brands to make their consumers’ lives easier, and experiences memorable. Dubai South is the fastest growing Free Zone among the business community due to its strategic location, unique concept, state-of-the-art infrastructure and innovative solutions to modern day challenges. Strategically located Dubai South is identified as the emirate’s flagship project since 2006 when it launched operations. Spreading over 145 square kilometers, Dubai South hosts the emirate’s second airport – the Al Maktoum International and the Expo 2020. The free zone is designed to support every conceivable kind of business and industry through its most popular and successful components such as Business Park and the Logistics District. Tap Payments is in the business of simplifying online payment acceptance for people in the Middle East. The company focuses on providing an easy, quick and secure online payment experience for businesses and consumers by offering an innovative tech-driven online payment gateway with robust payment technology, following global payment industry standards. "WebEngage is a B2C marketing automation suite that helps 40000+ companies across the globe drive more revenues from their existing customers & users. We help companies segment their custoemrs and engage with them across their lifecycle in a personalized manner through various channels such as Mobile Apps, SMS, Web Push, Email & On-site." Addenda is a UAE-based blockchain startup bringing trust to insurance industry, one block at a time. We use distributed ledger technology (DLT) to streamline processes between insurance companies. Tailored tasks are reported in real-time on our user friendly interface, and then timestamped as evidence onto the blockchain. Advanced Mobile Payment Inc. (AMP) is a global provider of complete payment solutions and POS products focused on security and smart integration options. Equipped with the latest certifications and able to integrate with any platform, AMP delivers tools designed to keep transactions secure and improve the payment experience. Al Nawras combines data-driven best practices and high-end creatives to ensure quality, performance, and a beautiful user interface in developing an e-commerce website that will help your business grow. We offer complementary services that include branding, graphic design, product photography, and online marketing. For 25 years we’ve been the preferred supplier of packaging and materials handling equipment to the Gulf’s manufacturing, retail and distribution industries. As the e-commerce sector grows, companies throughout the GCC rely on our void fill, conveying, and labelling solutions, backed by technicians and consumable supplies in UAE, KSA, & Oman. Alrais Labs is a fast growing software products and solutions center of excellence, with diverse Industry Solution Units. E-commerce, Digital Identity and Branding, Mobility & Enterprise Solutions are few such areas Alrais Labs specializes in. Key focus is on leveraging trending technologies and platforms to push for a business disruption in the challenging business environment and explore untapped channels of business for its customers. Alrais Labs’ influence in building up GCC’s E-commerce sector is unparalleled and its specialized wing Etailer Souq delivers a complete suite of solutions and services to build up a live store in a stunning speed. Altius is an Integrated Solutions Provider. Our proven expertise, leaves no room for inaccuracies. The experience in various industries like Manufacturing, Engineering, Cutting Tools, etc., has now given us a differentiated in-depth knowledge that we leverage upon. Altius also handholds & consults clients through implementing PIM tool and writing connectors to ERP & e-Commerce platforms. Amrut Software’s next gen E-Commerce & Retail Solutions offer integrated and Seamless Omni channel Customer experience. In an ever-changing and fragmented retail market, our approach allows businesses to re-think beyond the front, middle and back-end operations to deliver 360° solutions providing the market advantage. ar:met brings the most advanced augmented reality technology to your company. AR takes the traditional advertising and promotion methods to a whole different level. Allowing marketers and advertisers to promote products and services in totally new ways. Smartphone users have already embraced the AR technology and realized its benefits in real life. AtCash builds blockchain/ DLT based “trust networks” for record and data sharing. These highly secure networks are low cost alternatives to host-to-host connections. Automate KYC, AML and other record sharing or share asset values on a network. We also provide end-to-end contract automation solutions. AtCash is your digital transformation partner. Austria Card is a market leading European company with global reach in the field of secure communications for Payment, Government, Public Transport, Retail, and Industrial applications. The services of the company involve, amongst others, the development of highly secure operating systems, the production of card bodies, and mobile payment. Avetti Commerce is a multinational company with offices in 5 countries serving our customers worldwide. The Avetti Commerce platform is a scalable, enterprise level, Java based, Multi Store, B2B/B2C Ecommerce and Marketplace solution that we license or offer on a SaaS basis. We provide global teams to work with your staff to integrate and customize to meet your business needs and deadlines. "Beijing Shenzhou Anfu company is a high-tech enterprise engaged in financial pay-ment terminal products. It is committed to product research and development, system integration and technical services in the field of safe payment, providing mobile pay-ment products of international advanced level, offline payment products, and sweep the code payment products." "Founded in November 2012, Beijing Wiseasy Technology Co., Ltd. is the China’s leading provider of intelligent business hardware, has obtained the large supports from IDG Capital, Shining Capital and other famous investment institutions. We have been committed to the power of technology to promote future business development, providing the infrastructure and the underlying technology for commer-cial entities connecting to the Internet.We provide Business Intelligence hardware and services for banks, third party payment processors, software developers, system integrators, e-commerce platforms and other more than 1000 partners and more than 200,000 businesses." BioSmart Co., Ltd is a provider if cards products such as Credit, Banking, Transportation and loyalty card since 1971. Biosmart expanded its product boundaries and is specialized in Metal and Premium PVC banking cards for exclusive members and clients in private banks and clubs.
" Bitaqaty is a subsidiary of OneCard Launched in Saudi Arabia in 2004 as a part of the National Technology Group (NTG).Bitaqaty is the largest e-Vouchers distributor in MENA region, specializes in selling Virtual Products like E-Pins and Vouchers for games and many other online and offline services/productsAllowing millions of internet users in more than 20 countries to shop online securely. Holds a high market share, up to 60%, in the main markets in this region. We invite you to join us and experience the professional, knowledgeable, and efficient staff that has helped us become the number one choice for e-vouchers." Bitel Co., Ltd is an international provider of Point-of-Sale terminals worldwide. We offer countertops, wireless, mobile payment and PDA+POS devices. Our terminals have contactless payment, RIFD, IC card readers, and finger print sensors just to list a few. For more information, please check out our products at www.bitelpos.com. Based in Dubai, UAE, Block Gemini is the leading blockchain consultancy and solutions provider in the MENA region, working closely with Dubai's 2020 strategy. The company has a complete set of services to accomplish any blockchain based requirements, such as Custom Blockchain Development, Blockchain Consultation, ICO Deployment Services and Smart Contract Audits. Launched in early 2018, Boksha is a Dubai-based online marketplace for the region’s emerging independent fashion designers. Hospitality technology for forward thinking businesses. We design and build digital systems for the hospitability, food and leisure sectors. We help clients increase customer engagement and streamline operations. Castles Technology has been a leading solution provider in the payments industry since 1993.Castles seeks to provide customers with forward leaning technology and a customer experience that is unmatched. Headquartered in Taipei, Taiwan, Castles has regional offices in North America, Spain, Italy, Japan, China and Singapore. Now harness the true power of Omnichannel through our AI enabled technology platform coupled with Smart Ops. At Clues Network Technologies, we help build a sustainable , scalable, and profitable ecommerce business by working as a growth partner, and help manage all aspects of ecommerce including operations. We bring in our 7+ years expertise of building and running one of the largest ecommerce platforms in India, “ ShopClues”, which helps empower brands to take informed decisions based on crucial insights gathered from over 100 MN data points every month. Our team of experts understand that a consistent brand experience and scale are paramount when working with global brands like Al Hokair, Aldo, GAP, MANGO etc. 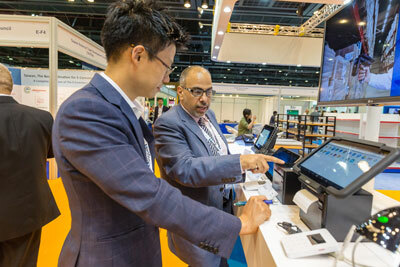 Cogent Technics helps create 'connected spaces for the offline world'. We employ patented technologies to collect live in-store counting, demographics and behavioral data. Visitor 'browsing' data is fed into our heuristic algorithms which assist in effective merchandising, marketing and operations decisions. Resulting omni-channel experience assures increased average order values and retail conversions. Compass Plus provides comprehensive, fully integrated and flexible payments software and services that help financial institutions stay competitive in today’s market. Our product offering includes card and account management, payment processing, fraud management, Internet and mobile banking and other systems necessary for developing and running successful electronic payment projects of all scales. Built by payment processing experts, Conciliant seeks to bridge the gap between payment network fees and card processing data giving banks and programme managers complete clarity over their cards. Conciliant provides granular data analysis, automated report generation for QMR, spend analytics, invoice forecasting and uncovers programme inefficiencies and incorrect billing. AI based complex software for e-commerce online-stores and platforms. The main target for the service is personalisation of content of the web site in strong touch to current interests of visitor , marketing companies personalisation based on each user`s behavioral portret, business processes optimization in pricing for new products in catalogue. DeafTawk is an online sign language interpretation service provider that aims to bridge the communication gap of 256 million deaf communities with the general public by providing quality sign language services in order to thrive. Designhubz is creating the next generation e-commerce interface for today's consumers and brands. We help brands bring in-store browsing experiences to online retail. We enable immersive and fully visual online shopping experiences, targeted to the web. Our 3D Cloud platform lets brands and retailers run highly interactive online stores on their websites and across all online channels. Also, brands will be able to instantly digitize their inventory to AR & VR through our proprietary hardware setup. Experiences powered by Designhubz drastically increase consumer engagement, conversion and loyalty. Digital Factors is the Platinum Partner of HID in MENA and the Regional Distributor of Fargo, Zebra and Smart ID Card Printers. We offer CD/DVD Publications and solution provider equipped with complete end-end range of solution cycle products for Credential management, Physical access security, Enterprise logical access security built through contact/contactless Smartcards & RFID based tracking/management solutions for your organization. "DigitalBliz is a London Based Fintech Company. The Group provides Blockchain related Financial Services through the London Headquarters with two Subsidiaries in Dubai and Lugano. DigitalBliz aims to provide the most reliable updated tool set dedicated to specialists in Security and Asset Token Trading as well as Crypto Currency dealers and analysts by providing high quality financial services and innovative products. DigitalBliz Deep4 and DigitalBliz Deep4C." Digital of Things takes a user-centric approach to UX, by using state-of-the-art technology to understand how people behave, and what they think, feel and do. Digital of Things put the customer at the center of everything they do and combine quantitative and qualitative insights to increase revenue, conversion and loyalty. Dressire is an AI based solution helping retailers maximise sales by getting to Know and Engage each customer as a unique individual on a massive scale. If you have a million customers, it creates a million stores. Dressire provides a personalised shopping experience In-Stores & Online while you benefit from shopper and trends insights. Dukkaani is a Pan-Arab smart shopping platform enabling all grocery stores to sell their products online. Targeting MENA due to its culture & lifestyle reflected into frequent high-volume Grocery Demand. As a Disruptive-Innovation, Dukkaani’s vision deploys AI to streamline Autonomous-Ordering by maintaining & building the household grocery-needs for the shoppers. ELYCTIS specializes in the development, industrialization, production and marketing of fixed (ID BOX One) and mobile readers (ID TAB) dedicated to Secure Identity Documents. Expert in eID projects (hardware and software developments), ELYCTIS sells its products through its network of distributors and systems integrators, to whom it provides development kits. eMcREY – Serving the Gulf, Middle East and North America, eMcREY delivers quality turn-key solutions with extensive expertise in the e-payment, financial, mobile payment, e-government, and transit sectors as well as cybersecurity, smart-city, BigData and IoT. Partnering with FIS, EntrustDatacard, Sequent and Welcome-RT, eMcREY’s holistic solutions span Multi-Channel Acquiring & Issuing, Fraud, Settlement, Card Management, NFC & HCE Mobile Payment, Loyalty, Payment Hub, Secure-ID and transit among others. EMITT Technology has revolutionized the region with ideas and solutions for interactive digital communication, especially in terms of pricing solutions such as Electronic Shelf Labels. We are experts in pricing strategy for retail markets and becoming the research and development centre for ISL (Interactive Electronic Shelf Label), the new Electronic Shelf Label produced by Hanshow. SHENZHEN EP Intelligent Technology Co., LTD was established in 2006. Headquarter in Shenzhen, And branches in Beijing, Shanghai, Wuhan, Xi’an, Chengdu, Guiyang in China. Over ten year of our efforts, EP Tech has been a leading supplier of Android Point-Of-Sale (POS), Payment Terminal Solutions (PTS), Handheld Data Terminal, and Handheld POS.EP Tech is dedicated to adding value to our customers and build long-term partnership with our customers, helping them grow in their business through high quality products, competitive pricing and outstanding customer service. eCommerce Arabia (“Erabia”) is a leader in digital commerce in the Middle East and North Africa. Erabia’s mission is to minimize the time, cost and complexity of establishing online stores for major retailers, distributors and manufacturers in the region, all on the basis of a small transaction fee that Erabia charges when a transaction is completed online. eTOP solution is a leading provider, supplier, distributor of IT security products, services and e-business solutions. We have a well established presence in services for Digital Signatures, Visual Identification Technologies, Authentication and Access control. eTOP boasts a broad product portfolio from an ID card printer, access control and time and attendance systems making it one stop for all your needs, providing all in one packaged solution. "Fdata Co., Ltd. is a high technology company specialized in “Internet + Finance” hardware and software development; and it's committed to providing professional, innovative, high-quality and efficient industrial customized services to global customers.FDATA offers customized solutions including smart payment, mobile payment, fiscal/tax control system, logistics (express) system, lottery gaming system, cash register system, smart property system, smart ticketing, smart customer service, smart transportation, financial innovation, IOT (internet of things), and cloud computing etc.Our group founded in 1995, has 20 years history, Fdata is one of the company in the group specialized in finance + internet business." Fincluziv helps banks increase revenues and acquire new customers at reduced costs and risks. Fincluziv offers banks a Product-as-a-Service that simplifies, automates and digitizes the entire process of short-term loans to employees and suppliers of their corporate clients. Fujian LANDI Commercial Equipment Co., Ltd. is ranked No.1 in China as a provider of electronic payment terminals and solutions with over 40% of the market share (report from CCIDC consulting), selected by all of the top 10 banks (Industrial and Commercial Bank of China, Bank of China, Agricultural Bank of China, China Construction Bank, Bank of Communications and likes more) and China UnionPay Merchant Services. Newland Payment Technology is a member of Newland Group, ranked No. 2 worldwide in the latest Nilson Report and now covers more than 30 countries in Asia Pacific, Latin America, Middle East and Europe. Newland Payment Technology offers a wide array of POS (point of sale), mPOS and intelligent multimedia systems. The Systems from Newland Payment Technology are used across many industries including commerce, finance, insurance, retail, logistics, government, etc. Newland Payment Technology has strong R&D capabilities to develop and introduce innovative products in the market and a long-standing relationship with its distributors worldwide with a recognized commercial market presence. "FutureCard is an international corporation, expert in the design, manufacturing and customization of all types of cards, from the most basic plastic cards to the most advanced smartcards. While digitalized data replaces paper formats, sustaining trust is a key issue. Both card issuers and cardholders require reliable products in order to operate safely in our efficiency driven world. FutureCard’s achievements have turned into the substantial assets we are proud to put at customers and partners servicesOur certified manufacturing plant produces EMV cards, GSM SIM cards and other ID, membership and scratch cards along with associated personalization and fulfillment solutions." Engauze is world's first AI & ML sales intelligence and customer retention tool which can convert any store into a smart store in 30 mins without any integration with POS or additional hardware by mapping the receipt generated post purchase with the visiting customer. All the data is mapped on a powerful & actionable POWER BI web dashboard which can capture upto 30 KPIs. "KEDE specialize in producing high resolution printing quality compatible card printer ribbons. Perfect instead of the original consumables, printing cost saving products. KEDE also offer Dye-sublimation Photo Paper/Ribbons & Thermal Transfer Ribbon.Add. : No. 2043 DongMen North, Luohu, Shenzhen, ChinaTel:+86 755 22900196 E-mail: Sales@kedetech.com Skype: kedetech QQ:1661995040"
Guangzhou Mingsen Mech.&Elec. Equipment Co.,Ltd is established in 1998, is engaged in development and manufacture of smart card system equipment and automatic production line. Provide complete equipment and personalized service of bank card, social security card, telecom card and SIM card. Guangzhou ZF Card is the largest smart card factory in China, we produce RFID Card, PVC Card, RFID inlay. HansaWorld is a leading international software house, with three decades of experience and innovation, providing a full suite of Enterprise Resource Planning (ERP), CRM and Point of Sale (POS) products as well as smaller accounting, retail and hospitality management apps that deliver the flexibility required by today’s businesses. Since 1990, HansemEUG has developed distinctive manuals for a variety of industries. Our 150-plus employees develop printed instructional manuals, technical and marketing content for mobile devices and the web, video tutorials, and apps for end users. Source content is translated into more than 50 languages and distributed around the world. Founded in 1871, our company started with one man, Carl Heinrich Hellmann, using a horse-drawn cart to deliver parcels in and around the town of Osnabrueck, northern Germany. Four generations later, Hellmann is a company with a worldwide network of 19,500 people in 437 branches in 162 countries. SaaS platform that empowers small businesses with the tools to create their own website and accept online payment seasoned with a friendly CRM and bookkeeping system. SMEs can be part of our marketplace to widen their customer base and increase revenues. "Topwise Group is a national level high-tech group corporation, established in Apr., 2006, headquartered in Shenzhen, specialized in R&D, production and sales of smart devices such as mobile phone, smart phone, tablet, smart POS terminal, etc. Now we have 3000 staffs, including 600 R&D engineers. " Howmuch is an award-winning store enablement solution for SMEs. Howmuch has grown to become full end to end solution covering POS, inventory management, social campaigns, customer management, as well as online shopping. Howmuch is armed with proprietary and sophisticated technology, aims to impact at macro level through data mining tools. "HyperPay is the fastest growing online payment service provider in the MENA region, serving the largest merchants and banks since 2010. Our local and regional payment processing options make it possible for you to accept a wide variety of payment types. " Inkript industries, is a subsidiary of RGH, an investment group based in Lebanon with a diversified portfolio of business covering the Middle East and Africa. Inkript develops customized solutions in the fields of security printing and cards production and delivers security print documents to governments, telecom operators and financial institutions. It offers smartcards including SIM cards, identification cards and payment cards in addition to security print documents, systems integration services and different corporate and governmental supplies and materials. InstaVal is a fast, cost-effective, independent business valuation SaaS, for anyone considering to (i) raise equity, (ii) invest in a venture (iii) or sell a business. Its AI powered engine transforms users’ inputs into business valuation reports for any industry, any size and any country in 10 mn for $100. Intellogate is a complex end-to-end solution providing remote transaction channels. The system includes a software suite and smart hardware solutions for the sale of different touchable and untouchable products, such as financial & utility services, tickets, food & non-food items, fuel, etc. All elements are solely designed, produced and personalized by Intellogate. IXLA provides equipment for the industry of plastic card personalization by using laser engraving technology. IXLA staff have Research and Development backgrounds in the laser-source industry and in specialized peripherals for distributed ICT. By producing all our own core components, we meet the design and supply demands of our Customers. Houge Technology is becoming global innovative customized POS service provider, leading the industry by providing quality products to customers worldwide, with its unique development perspective and forward-looking vision.JIANGSU HOUGE TECHNOLOGY CORP., formerly known as Zhangjiagang Houge Electronic Co., Ltd, founded in 1999. It is an innovative high-tech enterprise with core technology and many independent intellectual property rights, focused on customizing POS terminal, receipt and payment solution quickly and accurately for customers. Jin Guan Technologies (Shenzhen) Co., LTD is one of the leading equipment manufacturers for smart card industry. For more than 15 years we have been focusing on offering the high speed, high accuracy and high stability equipment for many of smart card giants around the world. Our products cover all ranges including sheet lamination machine, sheet punching machine, card milling&embedding machine, SIM card punching machine and complete solution for wire-less RFID. KeyBS, Key Business Solutions is a member of Arabi Holding Group KSC (AHG). A Dynamic Solution Provider & Systems Integrator Company offering a comprehensive range of technology solutions & value added services across diverse industries and various business sectors all over GCC & some African countries.KeyBS provides a complete portfolio of specialized services that simplify and automate payment processes using electronic services through multi channels including KIOSKs, ATMs, POS as well as E-channels such as Mobile Applications and Web Solutions. Established in 2003, Krish TechnoLabs is a leading full service digital commerce agency who excels at working with clients to create successful and profitable B2C and B2B eCommerce stores. Based in the heart of Dubai, we are the leading Magento Solution Partner in Middle-East and force behind top retailers and brands. "KYTronics was established in 1998, has been dedicated to R&D ofAUTO ID products and Electronic payment products as below.Ticket Issuing MachineKiosk Card Encode/PrinterThermal Rewritable Card PrinterSmart Card, Magnetic Card Reader WriterSmart Card, Magnetic Card DispenserCard Issuing MachineCard Collecting Machine"
LendFoundry is a next-generation, cloud based end-to-end lending platform. Packed with 50+, out-of-the-box integrations with major FinTech data providers and platforms, it can help digitize a lender's entire loan lifecycle to deliver faster loans and also add new customer segments. "The largest e-commerce site in the Arab world selling a digital products , where hundreds of Gift Cards(iTunes,Google,Playsation..etc) over a trusted platform that offers various local payment options.LikeCard all Gifts Card in One web page with Good prices." Localyser helps multi-location businesses better manage their online reviews from across the Web all from one place. "Leading provider of next generation Open Source P2PE payment terminals for Independent Payment Service Providers.Dynapro® - Retail POS for connection to a PC and Dynapro®Mini – mPOS for connection to Android, iOS and Windows devices.Leading providers of in-branch instant card issuance hardware; ExpressCardEMV7 next generation card issuance hardware platform." Malaysia Microelectronic Solutions Sdn. Bhd. (My-MS) is a Fabless Smartcard Chip Manufacturer. MYMS capabilities include in house Integrated Circuit (IC) Design for Microcontroller and Secured Memory chips. Our top product offerings includes MM23SC221 (Payphone), MM23SC4442 and MM23SC4428 (Loyalty/Access) & MM23SC8128RM (Identification) deployed in Malaysian National Identification Card (MyKAD). Premier Technologies is a leading white-label solution provider in the payment industry, trusted by banks and financial institutions around the world to process card payments securely. Premier has now launched MerchantSuite, a co-label secure payment gateway brand. With MerchantSuite, Premier’s enterprise grade technology is available to merchants of all sizes. MeReal Biometrics Limited is a Hong Kong private company dedicated to changing lives with a revolutionary biometric smart card for multiple payment and access applications. The only contact/contactless card with a fingerprint sensor, an acoustic signature and a recharging built-in battery. Use it anywhere, anytime not just at fixed readers but also on any device with a microphone, including the world's 9 billion phone lines. Patented globally and in production. The technology was developed in France and the headquarters were set-up in Hong Kong to launch the technology globally, seeking partners and strategic investors and focusing on Asia and beyond. Milople is a technology company designing world class products to simplify & enhance global commerce. We offer Product Configurator, 3D Model viewer, retail AR VR, Virtual try-on, web to print stores, subscription stores and product visualizer. We build new ecommerce stores on SAAS and we offer end to end magento development and marketing services too. Pairing cutting-edge technology with expert talent, MiNT provide an unparalleled content production service for online retailers. Clients of MiNT finally have a one-stop solution for all areas of their content and creative requirements whilst streamlining in-house costs and time to market. "Fujian Morefun Electronic Technology Co., Ltd.Payment technology for a new era of cashless world. We are ranked the 15th largest manufacturer worldwide based on the POS terminal shipments 2017. We supply PCI compliance POS terminals to payment processing companies and banks. We have senior professional technical team working with universities for cutting-edge research & product development. It’s our honor and duty to be dedicated to providing safe and reliable payment products for the social payment revolution. " "Mozaic Innovative Solutions specialized in providing SMART Customer Engagement solutions for retail businesses. We provide technology and business expertise to design and implement the right solutions, tune it with the time, and maximize the benefits from it." Mutamer is the first platform providing online Umrah trips reservations.The platform is a two sided marketplace that seeks to match customers want to go to Umrah with travel agencies, Customers can explore available trips with full details, book their trips and pay online through our Mobile App or Website. "NaviPartner is Microsoft Gold Partner developing, implementing and supporting omnichannel solutions for the retailing industry. As our customer you reap the benefits of one unified, scalable platform for Point of Sales, web store, warehouse, accounting and administration. This will empower you to focus on developing further, no matter the size of your business. NaviPartner has 25 years of experience in implementing digital commerce. Our software runs in more than 1,500 businesses throughout the world and is Certified for Microsoft Dynamics. Please meet us at stand (E-T46) or download a free trial on our website.www.navipartner.com"
NOVUS - MORE.SPACE.SYSTEM. Always good for a new surprise, the NOVUS more space system demonstrates how easy it is to optimise the use of existing space at the POS in a systematic way. Its practical solutions turn the POS into a convenient and comfortable place to work in, not least because of its outstanding product qualities. "NT.Payments excels in providing efficient payment machines, innovative advertising solutions and a suite of technical services for self-service kiosks.We have taken it upon ourselves to develop and expand the largest self-service kiosk network in the UAE that now includes more than 2700 modern efficient kiosks, and more than 200 advertising screens across the UAE earned us the trust of 3.5 million regular clients and catch 1.2 million views of published advertisements." Today Oasys Technologies is one of the world’s leading manufacturers of innovative, high efficiency equipment for the production of ISO plastic cards. Dedicated to progressive technology Oasys has created a range of primary card production equipment for the collation, tapelaying, laminating and cutting of ISO standard credit cards and smart cards. A range of systems and automation is offered within each function to suit all sizes of card producer while maintaining the same high quality of card production. Ofaly is the first full-stack fintech company in the Arab world, manufacturing our own hardware, developing our own software, operating our own services.We act as manufacturer, software developer, consultant, and operator, depending on the needs of the stakeholders.Ofaly is launching the first Arab-made ATM at Seamless! Orbitvu offers in-house automated product photography studios for taking still pictures, 360 presentations, and videos, that can be operated without advanced photographic knowledge. Our technology automatically removes the background, limits the scope of post-production and ensures consistency and repeatability of images, accelerating work and reducing costs. We are the Russian company that has gained 25 year experience in plastic cards manufacturing and personalization.We provide turnkey solutions for plastic cards production.We produce and supply inlays for contactless and dual interface smart cards based on different technologies. We develop and support plastic cards personalization and data preparation software. Palladium payment services LLC is one of the leading payment service providers in the Gulf and Middle East region and registered as a Payment Service Provider in UAE. Pallapay is a service that enables you to pay, send money, and accept payments. PAX Technology is a global provider of electronic payment solutions, offering world-class and superior quality products. Building on its service excellence and proven leadership position, PAX is one of the fastest growing payment industry providers with state-of-the-art manufacturing facilities, excellent R&D capabilities and a worldwide network of channel partners. Paydo is a cloud-based integrated platform empowering day-to-day operation for business owners in the online trading space. It provides a suite of tightly integrated services such as E-commerce, Payment, fulfillment, delivery management, and customer care. Paydo Head office is located in Kuwait City with 2 other branches in Dubai and Riyadh. PointCheckout is an online payment gateway for loyalty and reward programs which allows members of those programs to pay using points and miles instantly at any online merchant in our network. PointCheckout provides reward programs with an aggregated redemption network of top merchants across GCC that reduces the time and cost of managing the redemption and reconciliation process by almost 70%. Online merchants get access to customers with the some of the lowest customer acquisition cost in the industry and great brand value. Qlik is on a mission to create a data-literate world, where everyone can use data to solve their most challenging problems. Qlik’s end-to-end data management and analytics platform brings together all of an organization’s data from any source, enabling people at any skill level to use their curiosity to uncover insights. Quanterium Blockchain is a Dubai based developer for smart solutions integrating IOT sensors, Blockchain and Artificial Intelligence, to help clients accelerate business growth and efficiency in a more competitive and Data driven ecosystem. Quanterium caters to Healthcare, Government and E-commerce businesses to ensure competitive advantage through lower cost of operation, greater user reach and customer retention. Redbox is a digital commerce consultancy with global reach and experience. The company provides solutions based on the Magento Enterprise suite of products and is one of only five Magento Global Elite Partners and the only accredited Magento Order Management Solution partner.Founded in 2004, Redbox has built a reputation for delivering high-quality, custom-built digital commerce platforms for many well-known B2B and B2C brands including Paperchase, Nespresso, Oliver Sweeney, Universal Music Group and Screwfix. The company supports clients across 20 countries and has offices in London, Dubai, Sydney, Auckland, Mauritius, Modena and South Africa. We make registrations easy. Our solution allows our partners to grow faster by removing friction in the sign-up process. It is super simple to integrate, globally localized and uses smart data to keep typing to a minimum. "RENOME-SMART LLC for 25 years acts as an expert in the field of self-servicing developing and implementing solutions for payment receipt, handling cash flows and rendering services in the automatic mode.The main activities are the supply of turnkey solutions for banks, logistics companies, retailers, telco operators as well as full outsourcing services of the operating business.The majority of RENOME-SMART solutions are proprietary and they all pass the stages of design, engineering and manufacturing directly in Ukraine. Our services and solutions are used by banks and financial institutions of 10 countries worldwide." Saee.sa is a complete, rigorous and innovative logistics and delivery solution covering KSA with ready plan to expand in Gulf and MENA regions. Saee has an outstanding continuous improvement plan to support high success rate and income for our clientele. Guaranteed customer satisfaction is our mission where we work day and night to assure. Salutat partners with financial institutions to improve digital customer experience. We replace SMS blasts with 2-way, personalized smartphone chats by automating and enhancing customer conversations. Messages are sent using the Salutat APP to customers on preferred channels e.g. WhatsApp. Salutat reduces staff communication time/costs significantly and drives superior customer repayment, sales, and retention. Salutat’s real-time data analytics and reporting includes an early warning system for declining customer engagement and staff performance (including fraud/harassment language alerts). SBL International is an Asset management entity offering flagship FINTECH platforms to manage ‘secured asset portfolios’. Our ‘solutions & services’ are designed to mitigate risk & facilitate a 100% increase in bottom line. Our Fleet telematics 'Secure ME' is specialized system to digitize automotive finance portfolios. It has been built to cut down losses massively, with built in early warning indicators, provide full control on assets/vehicles and facilitate business expansion in SME Fleets. SCSPro have devoted ourselves only to developing smart card payment systems since May 2002 and supplied customers with customized total solutions including H/W (contact/contactless card readers, terminals) and S/W developments and consulting services (certification management on PCI PTS and EMV L1, L2, RF EMV, PayPass, payWave) for customer's needs. SEDCO is a global provider of comprehensive Customer Experience Management (CEM) solutions that transform the customer journey through all possible touchpoints, keeping the customers happy while increasing ROI.Beside its innovative smart branch concept -Queuing Management, Digital Signage, Customer Feedback, Business Intelligence- SEDCO’s alternative channels extend your services beyond branches and working hours, with Self Service Kiosks, Virtual Service Machines, and Self Service Shops that can dispense SIM cards, mobile devices and tablets, your services are available 24/7. SEDCO’s CEM Platforms are being used in more than 50 countries across the world by Finance, Telecom, Healthcare, Retail and Governmental institutions. For leaders who want to take better business decisions. Selma is a cloud application that brings actionable intelligence to elevate your revenue performance and marketing impact.Unlike consulting companies or corporate software suites, Selma’s accessible technology provides daily guidance (that means we’re fast) through result-oriented insights – all while keeping your precious data safe (just ask our Data Protection Officer). "Global Total Printing Solution Leader, SEWOO. We have been dedicated to making a better Total Printing Solution with diverse innovative and reliable products. Our product lines include POS printers, Mobile printers and Label printers reflecting rapidly changing market demands in the Retail, Hospitality, and AIDC industries. We also make diverse interfaces and accessories to provide easier use of our printers and ensure customer satisfaction." For more than a decade, Piotec has been always focusing on the development, manufacture and sales of automation products in fields such as IOT, mobile communication, identity authentication, financial services and government affairs, also providing safe and reliable solutions for the semiconductor and smart card manufacturers. Decard , your reliable partner for electronic identity card solutions and card payment. Shenzhen Hongjiali Information & Technology Co., Ltd. is specialized in designing and producing kiosks, network cabinets and sheet metal processing products. Since our establishment, inheriting the operation concept of "technology leading, innovation boundless" and the foundation concept of "human bases, quality first,customers utmost,pursuing magnificence",and relying on advanced technical development platform,precise manufacturing and processing capacity and ISO9001 modern management mode,Hongjiali staff are ambitiously progressing with the suppliers and customers. Shenzhen ES Electronic Co., Ltd. (ES for short), founded in 2004, is a state-level high-tech enterprise that provides one-stop "Silicone +" service for worldwide customers through technical consultation, product customization, production and sales.At present, we have been recognized by thousands of customers in 17 countries around the world. We believe that the silicone manufacturing industry should to win by professionalism and quality. ES together with customers, partners, win-win cooperate and build a more professional and efficient industrial environment and promote industry progress. "Shenzhen Focused Smartech Co., Ltd is an industry-leading professional manufac-turer of Smart Card and RFID Label products with total assets of 3 million USD and a land of 3,000㎡.We have formed several series of main products like contactless IC Card, RFID La-bel, RFID Card inlay, key chain,epoxy card, RFID Wristband ,RFID Reader/Writer etc.With the principle of “customer first, keep developing and being honest & responsible” Focused will keep developing and innovate to better prompt RFID technology applica-tion in every walk of life"
"JHL TECHNOLOGY CO., LTD. Is a hi-tech enterprise that professional and focus on design and manufacture financial payment ternimals.Major products including traditional POS Terminal, Mobile POS terminal, Smart POS terminal and payment system software solutions, already certified with UnionPay, PBOC, QPBOC, PCI, EMV, 3C, RoHS, CE etc…JHL was founded in 2014, located in Shenzhen, with strong R&D team, support ODM & OEM projects, qualified with ISO9001, BSCI…, factory with more than 5000㎡and 300 workers, with good reputation all over the world！"
POS system hardware solutions for more than 1000 importers and distributors from all over the world, We supply them most innovative and high quality POS system hardware to help them fulfills their consumer visual and functional demands.We mainly specialized in development & manufacturer of POS input & output system hardware products including:15" touch screen all in one POS terminal, touch screen monitor, cash drawer, POS thermal receipt bill printer, portable mobile bluetooth printer, DOT matrix printer, kitchen receipt printer, , barcode reader, VFD customer display, magnetic card reader, etc. XCC RFID (China) is one of the largest manufacturers of RFID hardware in Guangdong Province.It is also one of the most important IC distributors of Fudan and GT in Southern China.Main production lines consist of XCC RFID cards inlay / prelam, PVC sheets, RFID cards, labels, key tabs. In just a few clicks, Sineo Packaging centralizes, simplifies and streamlines the entire packaging supply chain from production to delivery for the F&B, Retail and E-commerce sectors. SHENZHEN SEAORY TECHNOLOGY CO., LTD is a hi-tech company dedicated to smart card field since 2002. We are specialized in manufacturing, researching, developing and selling of smart card, personalization card printer and smart card application system. "Shenzhen Suprint Smart Technology Co.,Ltd, established in 2014 and focusing on R&D of thermal printing technology, photo printing and cards issuance solutions. At present we are the first company in China mainland who grasp the core technology of thermal printing and fulfill the industrialization accordingly.Here are the products with autonomous technology:SUP300 Printer for single-sided cardsSUP400 Printer for two-sided cardsDYP1000 Desktop High-speed Card IssuerMTH30 Series with multiple slotsWe now own over 20 patents for inventions, utility models and appearance designs.CREATED IN CHINA AND CUSTOMER RELIABLE are our pursues in the long run." Founded in 2001, Shenzhen Xinguodu Technology Co., Ltd (NEXGO) is a high-tech enterprise dedicates to R&D, manufacture of POS terminals and provides comprehensive associated technical services for electronic payment. NEXGO was officially listed on the Growth Enterprises Market in October 2010. YMJ specializes in R&D and manufacturing of contact card, contactless card, dual interface card, RFID production equipments and all kind of card testing equipments. ShopGo is an eCommerce platform that gives the user a website and platform that is tailored to the MENA market with local payment and shipping options.No need to have a background in programming, our ready solution provides beginners and experts alike with all the tools you need to run and grow a successful online business. Simplifai Labs is creating a new shopping experience in the Arab world by providing an innovative solution for eCommerce and Retail brands by turning any image content into a seamless online shopping experience using our cutting-edge Artificial Intelligence enabled Visual Discovery Technology. SKY EXPRESS INTERNATIONAL LLC is a major player and has a formidable presence in express courier service in the UAE. We offer quality service to banking and financial institutions, trading and insurance companies. We serve more than 140 countries and reach 1500 destinations through our network. We have a global presence in all the continents through strategic tie ups with leading Express delivery companies. SPS, is a subsidiary of IN Groupe and specializes in contactless and dual interface smart cards, and high-quality inlays for e-Passports. The company is positioned on markets for electronic ID and banking cards. Its market is based on an unrivalled proprietary patented technology, providing for governments, national printing houses and smart card manufacturers. Smart World solutions provides the scalability and flexibility to meet today's business challenges, while empowering enterprises for even greater success tomorrow. Smart World believes in offering products & solutions to clients through consultancy , i.e. We consult first and offer the right solution. This methodology has helped our clients achieve rapid return on investment advantage. With the lack of accurate consumers’ data in the region and challenges of measuring offline media spends; SNASH will provide partnering brands with REAL demographical data about consumers by driving mobile users to scan their grocery receipts every time they shop from any Online/Offline store in UAE. SPAN is a leading consultant and solution provider of systems and equipment, for your distribution centre, supply chain and workplace requirements. Since 1989, Span's multilingual team have implemented innovative solutions to a wide spectrum of end users in the MENA region, including but not limited to 3PL,FMCG,military & government retail, healthcare, manufacturing, automotive and hospitality. SPECTRA Technologies Holdings Co. Ltd., founded in 1993, is the Greater China Leader in design and development of electronic transaction technologies and solutions for banking & finance industries. With our expertise and experience, we design and develop future ready technologies and solutions aiming to provide our customers with pioneered and value-added services. We provide POS terminals with options of countertop, mobile and contactless feature. We envision to build a robust, customer centric online platform that distributes and facilitates the delivery of any service a consumer may desire; we envisage to drive convenience to our users by providing consistency and standardizing the quality of services our users experience. "Statys delivers risk analytics as-a-service, powered by artificial intelligence. Designed for financial institutions and FinTechs, our API-first solution uses financial and alternative data to provide insight and automation. Reduces defaults & opens access to thin file businesses to increase the size of the lendable market.Currently being accelerated by Startupbootcamp FinTech Dubai 2019, in partnership with HSBC, Visa and DIFC. Winners of the AWS MENA startup challenge." SWAN is focused on providing a seamless phy-gital (connecting physical with digital) solution to the users for their shopping needs. The platform is designed to assist the entire user journey fromstore selection to enriching customer’s shopping experience inside the physical store. Swittle is an invoice management, payment and financing platform. By offering payers convenient ways to settle bills (cash, card, or transfers across digital and physical channels), we accelerate receivable collections for billers. Swittle will also provide intelligent receivable management tools, instalments options and invoice financing. For swift settlements, join Swittle. Symlink Corporation specializes in the design, production and distribution of highly reliable and innovative POS Payment Terminal devices. We have a full range of products from Countertop/Mobile EFTPOS Terminals, PCI PIN Pad/SMART PIN PAD, Contactless Card Readers/NFC, Unattended Payment Terminals, mPOS/Tablet All-in-one Payment + POS Solution Terminals, and SMART POS. SZZT is the leading manufacturer of PCI EPP, POS Terminal and Kiosk. With more than 20 years secure payment solutions experiences，we ranked top 3 provider in the China market. Our products are designed to help customer increase sales, boost productivity, operate more cost -effciently, and enhance trading partner relationship. "We are a full service digital solutions agency that provides digital consultancy to build an effective solution for your business and customers. From branding to mobile application development we look into the nitty-gritty to ensure that your digital footprint is on point and make relevant impact on your digital presences." """Telr is the region’s leading payment gateway service provider, offering a set of unified APIs and tools that instantly enable businesses to accept and manage online payments via web, mobile and social media. Telr also offers business critical and sales enhancement features like Automated Merchant Onboarding, Risk & Fraud Management, Recurring Payments, Multi-currency processing and, Social Payments.Founded in 2013 by Sirish Kumar, Telr, provides online and mobile multi-currencies payment gateway processing services to merchants in emerging markets across Southeast Asia, Middle East and Africa." Our device is using robotic technology to bring the real, physical products to life. With our help, the product can move, talk or sing, engaging the shopper directly. Easy to install in any shelf or display unit, we have proven impressive results with sales lifts averaging 200%. "TOSAN Techno is the leader and the largest suppliers of payment solutions for Iranian banks and payment companies. TOSAN Techno supplies EFT-POS terminal equipment, payment switch, software applications including payment applications, TMS system, and acquiring management systems. TOSAN Techno banking solutions includes ATM machines, VTM machines, Cash In machines, Cash In/Cash Out machines, Cashless machines and related applications, ATM monitoring system.TOSAN Techno has installed more than 1,400,000 POS, over 2000 ATM, about 150 VTM and more than 400 Recycler.TOSAN Techno is the first company in IRAN who has installed Video Teller Machine (VTM) in Iranian banks and has developed the first QR payment service in this country." TPS is a leading company in the space of Cards and Payments solutions serving a delighted customer base of over 130 banks, telecoms, central banks, payment processors and other financial institutions spread across 32 countries. TPS offers a combination of technical and business expertise in the area of card management, multi-channel issuing and acquiring, payment processing, alternate delivery channel management, bills presentment and payment, remittances, payment gateway and internet & mobile banking. Udentify is a computer vision based real-time in-store monitoring solution to optimize your stores' operations. Our people counter can predict the age and the gender of customers. The system assigns an anonymous ID for each customer and tracks them from the door to cash out. Ultinous offers customer insights for brick and mortar Retailers through its AI-based in-store video analytics platform. It counts footfall and passer-by traffic, recognises returning customers and known offenders. It also measures dwell times, provides promotional area statistics, creates heat maps and shortens queues through its Queue Prediction and Alert Tool. USP (United Security Printing) – A Department of United Printing and Publishing in Abudhabi, is a single source provider of Total Card Security Solutions, catering to the evolving and expanding secure printing business needs of Banking, Government, Telecom, Retail, Hospitality, Transport and other industries seeking efficiency, security and personalization.Combined with our Technical know-how, short lead time, flexibility in service, competitive pricing and the knowledge that the cards are produced from a single secure and accredited UAE site, makes USP the perfect choice to create a secure chain of trust. We help our customers drive their business growth through visitor analytics by tracking customers / visitors / passengers in physical locations with our sensors and analyzing this data on our cloud based business intelligence platform. Our people counting, heatmap, queue management devices have been installed in 25.000 locations worldwide. Founded in 2008, Vaimo is the global leader in delivering award-winning digital storefronts, omnichannel solutions and mobile apps. Their only focus is to accelerate B2B and B2C sales for their clients. With 20 global offices across EMEA and APAC and over 400 employees, Vaimo provides an international presence that allows them to cultivate close, long-term relationships with their clients. Founded in 2007, Vanstone Electronic (Beijing) Co., Ltd is committed to be the leading electronic payment terminal and solution provider in the world. Verisoft is an agile software company with 30 years experience on electronic payment systems.We are always adapting to the evolving requirements of this dynamic sector which started with magnetic stripe cards and evolved to smartcards and now NFC mobile host card emulation. We have solutions for every step of this field from card issuance of plastic magstripe and chip cards to EFT/POS and ATM switching systems, gift cards and loyalty systems to prepaid, debit and credit card systems, EFT/POS software development to Apple iOS and Android mobile Apps. Viume is on a mission to transform the way people think about shopping of clothes. Viume SaaS provides e-retailers with an AI Fashion Assistant that eliminates product search and instantly show to their customers personalized recommendations of total looks based on internal and external inputs. Then, e-retailers achieve higher conversion rates and boost AOV. Volante Technologies enhances business agility in 80+ financial institutions and corporates globally. Our solutions promise rapid implementations in payments on-boarding, pre-processing, processing, clearing and financial message integration. With our out-of-box software, extensive automation, configuration rather than coding and inbuilt testing, we promise significantly accelerated implementations for large or small projects. what3words is the simplest way to talk about location. It has divided the world into 3m x 3m squares, each with a unique 3 word address. Now people can refer to any precise location using just three simple words. Its partners include Mercedes-Benz, Airbnb, the UN, Aramex and Dominos. Wimo is a cloud-based multi-carrier platform which enables retailers and merchant manage their delivery management operations across different couriers with best prices and service standards across GCC and the globe. We work with leading couriers locally and regionally. We also power leading retailers and ecommerce merchants. Fintech software provider,based on EMV card personalization system, as the FIRST vendor to pro-vide complete EMV solution in India to support Multos DPAS, which is also well known as Ru-Pay.Wisecard is developing innovative payment solutions ,POS terminals and authentication plat-form that secure mobile and contactless payments and banking transactions around the globe. WonderStore commercializes a computer vision platform for retail that satisfies the strategic need to know the shop visitors, understand their desires and anticipate their behaviour. The WonderStore platform is able to profile visitors by gender, age, emotions, glasses, hair and make-up, analyse and present data in comprehensible BI dashboards. Professional smart card manufacturer, professional solution and service provider. "WUXI HESHIDUN METAL PRODUCTS CO.,LTD IS LOCATED IN WUXI CITY, JIANGSU PROVINCE ,CHINA.WE HAVE THE SUPERIOR GEOGRAPHICAL LOCATION AND CONVENIENT TRANSPORTATION BECAUSE WE ARE VERY NEAR TO SHANGHAI.OUR COMPANY WAS ESTABLISHED IN 2005, IT IS A LARGE PRIVATE COMMERICAL EQUIPMENT COMPANY WITH ITS OWN BRAND AND MAINLY PRODUCES SUPERMARKET SHELVES, WAREHOUSE RACKS ETC. UP TO NOW, WE ALREADY HAD 13 YEARS RICH PRODUCTION AND SALES EXPERIENCE.OUR COMPANY COVERS AN AREA OF 10,700 SQUARE METERS AND THE PLANT AREA IS EVEN MORE THAN 15,000 SQUARE METERS, NOW WE HAVE MORE THAN 80 EMPLOYEES.WELCOME YOU TO CONTACT US AT ANY TIME, MAYBE WE CAN MAKE FRIENDS FIRSTLY INSTEAD OF BUSINESS." Wuyi Yueda Electronics Co., Ltd., lying in Wuyi, Zhejiang province of China, is specialized in manufacturing EAS products with independent designing and R&D ability. Equipped with a formulated manufacturing plant, professional R&D teams, and the advanced testing facilities as well as strict quality control, we strive to provide customers with the most cost-effective products. Xpence is a digital-only business current account for freelancers, solo entrepreneurs and startups. We combine bookkeeping and banking in one beautiful and easy to use app. Xpence makes opening a business current account and managing finances much simpler for new businesses. Xpence takes the pain out of business management by providing time-saving tools such as automated expensing, bookkeeping, and invoicing on the go. All Xpence users receive a premium contactless Xpence card that can be used globally for payments online and instore. Xpence is the Gulf region’s first neobank designed by entrepreneurs for entrepreneurs. "TRANSMO Wire is a professional enamelled wire manufacturer for fine and ultra-fine enameled wire, as well as Litz wire. The finest wire diameter reach 10 micro. TRANSMO have been a leading supplier for self-bonding wire and High Tension Wire. We do full length on-line laser monitor in production, Full inspection on fin-ished product, Full process trace. We supply wires word wide. Especially, we are experienced in RFID field, our wire suitable for different process technology and ensure quality of final product. Our stand No. is E12, we expecting you to visit us, to create business and make friend." BloggersIdeas was founded in 2012 with the aim to help bloggers & SEO’s who struggle to understand the concept of Internet Marketing. Here are some examples of how BloggersIdeas can help you and why you’ll find this blog useful: It gives you regular Blogging tips to help you blog better. You can also ask for assistance in person. BloggersIdeas gives the best tactics to increase traffic to your blog by making use of SEO. You can learn to create SEO-friendly content with these tips. It also offers certain guides to learn SEO in depth. We also have videos as well as the blog interviewing Top SEO Experts which can help you to clear many doubts. Also, you can get the Blogging Tips as well as the WordPress Tutorials, Plugins tutorials. Arabian Radio Network consists of nine FM radio stations with 4.1 million weekly listeners. ARN reaches a larger audience than any other radio network in the UAE. Committed to improving the quality of broadcasting standards we are proud to sit at the forefront of the region’s media innovation. All our brands are accessible on air, online and via the latest smartphone apps. Delivering targeted communication solutions successfully connecting our advertisers with the UAE’s diverse population. ARN is a subsidiary of Arab Media Group (AMG), a leading entertainment media organization in the UAE. No.1 in Central Region and Riyadh city...Al-Jazirah ... the leading Saudi daily newspaper - IPSOS 2014Provides unique added value features in Al-Jazirah Printing Press • Readership more than 500.000, and only audited newspaper KSA • the only source of news to university students and staff in 12 top uni¬versities. Copies are dis¬tributed daily among students as part of Al-Jazirah’s Re¬search Chairs Sponsorship Program which grants Al-Jazirah exclusive distribution rights. • Launched several websites since 1997 also introduced several Mobile apps since 2011. • Launched unique printing features in 2015; the double gate fold, scented ink, special colors, die cut, perforation and automated adversticker. CryptoNewsZ is a News Publication Media that provides updates on cryptocurrency, ICOs, DApps, and blockchain. As more and more people turn to cryptocurrencies every passing day, we cater high-quality, unbiased and well-analyzed content to them. We cover the latest news, price analysis and interviews for the crypto community. Reporters at CryptoNewsZ work round the clock to provide upbeat, timely and consistent news updates to its readers. Thus CryptoNewsZ endeavors to fill the void of a reliable source of information in digital currency community. Bandwidth Recruitment is an independent provider of permanent, contract and interim staff specialising in the cards & payments sector.We have spent years working within the payments sector to build an enviable network of contacts which, combined with a thorough understanding of the payments lifecycle, enables us to understand our clients' requirements in detail and accurately match the most appropriate candidates. Wamda accelerates entrepreneurship ecosystems throughout the MENA region by joining Wamda Capital, the most active, multi-stage, sector agnostic venture capital fund investing in high growth technology or technology-enabled startups across the MENA, and the Wamda Platform, the leading knowledge platform offering integrated programs including media, community development, research, corporate and government advisory services to the various stakeholders of the MENA startup ecosystem. ITP.net is the Gulf’s longest-running technology news site, touching on national, regional and global events relevant to CIOs and tech-savvy consumers. ITP.net features breaking news, product reviews, expert analysis, in-depth features, galleries and more. Payments Cards & Mobile offers a multi-media marketing platform. We have over twenty years experience reporting on Card Payments, POS Terminals, Issuing and Acquiring and Risk & Compliance plus the cutting edge technology of M-Payments, Contactless, m-POS and e-Commerce. The print and digital magazine is produced six times a year, with supplements, and has a worldwide distribution.It also publishes a free daily newsletter.We also offer Research, Consultancy and Marketing. If you need help evolving your product or business in the payments market, we can provide all the services you need. Fintech Galaxy is a global crowdsourcing platform that empowers the financial technology (fintech) community by connecting startups and entrepreneurs to banks, corporations and government entities to solve innovation challenges. Fintech Galaxy is built around the concept of crowdsourcing, which is the practice of obtaining ideas, funds, time, expertise etc. from a group of people or a ‘crowd’. As the leading supplier of executive recruitment, RPO services and Headhunting to the Fintech and Payments industry, Payments & Cards Network is dedicated to connecting great people to equally great companies.Payments & Cards Network is also the proud publisher of Payments & Cards Magazine (PCM), an online monthly publication focused on all the news in Payments, Cards and Fintech. It is currently reaching over 150,000 unique readers per month. APAC CIOoutlook is a print magazine that aims to provide a platform for CIOs, CTOs and other senior level IT buyers and decision makers along with CXOs of solution providers to share their experiences, wisdom and advice with enterprise IT community of APAC countries. We promote our unique 'learn from our peers approach' in the Asia Pacific region. Essential Retail has over five years of experience covering breaking global news in the retail technology space. Led by Caroline Baldwin the editorial team deliver in-depth news, analysis and features providing an independent voice in the digital revolution transforming the retail industry. If retailers need to know it, Essential Retail covers it.Essential Retail also provides free educational content including webinars, whitepapers and round table events making it a key learning resource for industry professionals. MyUAEGuide is the biggest portal for local businesses, events and city information. It hosts over 10,000 properties, cars and job offers!300,000 businesses are already listed on www.myuaeguide.com!The website is not only being promoted via various online search engines, social networking sites, but also at the trade exhibitions in the UK, UAE and worldwide. For companies that are looking for the best practices and handy tutorials in the e-commerce and digital industry, E-Commerce Nation is the blog for you. The first cross-border e-commerce community focuses on a global perspective of the industry, welcoming experts from all around the world to contribute to their platform. We offer webinars, online courses, tutorials, and in-depth articles on how to best develop your online business. Fintech News Middle East covers stories about the Fintech Ecosystem – i.e. Mobile Payment, Personal Finance, Bitcoin, Blockchain, Regtech, Robo Advisor and Lending - and Startups in UAE and Middle East. yBitcoin has been a trusted and educational introductory primer into the world of Bitcoin and the blockchain since 2013. Arab Advisors Group is a specialized research, analysis and consulting company focused on the communications, media, technology and financial service providers throughout the Arab World (MENA) region. Arab Advisors Group scope of services include providing primary research based analysis, market sizing forecasting, the competitive landscape, the regulatory landscape, market research, technology developments, market opportunity and risk assessments.